Jimmie Lee Jackson (December 16, 1938 – February 26, 1965) was a civil rights activist in Marion, Alabama, and a deacon in the Baptist church. On February 18, 1965, while participating in a peaceful voting rights march in his city, he was beaten by troopers and shot by Alabama State Trooper James Bonard Fowler. Jackson was unarmed and died eight days later in the hospital. His death was part of the inspiration for the Selma to Montgomery marches in March 1965, a major event in the American Civil Rights Movement that helped gain Congressional passage of the Voting Rights Act of 1965. This opened the door to millions of African Americans being able to vote again in Alabama and across the South, regaining participation as citizens in the political system for the first time since the turn of the 20th century, when they were disenfranchised by state constitutions and discriminatory practices. In 2007 former trooper Fowler was indicted in Jackson's death, and in 2010 he pleaded guilty to manslaughter. He was sentenced to six months in prison. 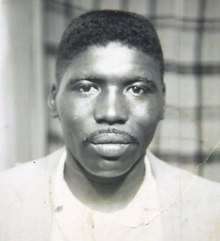 Jimmie Lee Jackson was a deacon of the St. James Baptist Church in Marion, Alabama, ordained in the summer of 1964. Jackson had tried to register to vote for four years, without success under the discriminatory system maintained by Alabama officials. Jackson was inspired by Martin Luther King, Jr., who had come with other Southern Christian Leadership Conference (SCLC) staff to Selma, Alabama, to help local activists in their voter registration campaign. Jackson attended meetings several nights a week at Zion's Chapel Methodist Church. His desire to vote led to his death at the hands of an Alabama State Trooper. It inspired Southern Christian Leadership Conference leader James Bevel to initiate and organize the dramatic Selma to Montgomery marches, which directly contributed to President Lyndon Johnson calling for, and Congress passing, the Voting Rights Act of 1965. On the night of February 18, 1965, about 500 people organized by the SCLC activist C.T. Vivian left Zion United Methodist Church in Marion and attempted a peaceful walk to the Perry County jail, about a half a block away, where young civil-rights worker James Orange was being held. The marchers planned to sing hymns and return to the church. Police later said that they believed the crowd was planning a jailbreak. They were met at the post office by a line of Marion police officers, sheriff's deputies and Alabama state troopers. During the standoff, streetlights were abruptly turned off (some sources say they were shot out by the police), and the police began to beat the protesters. Among those beaten were two United Press International photographers, whose cameras were smashed, and NBC News correspondent Richard Valeriani, who was beaten so badly that he was hospitalized. The marchers turned and scattered back toward the church. Jackson, his mother Viola Jackson, and his 82-year-old grandfather Cager Lee, ran into Mack's Café behind the church, pursued by state troopers. Police clubbed Lee to the floor in the kitchen; when Viola attempted to pull the police off, she was also beaten. When Jackson tried to protect his mother, one trooper threw him against a cigarette machine. A second trooper shot Jackson twice in the abdomen. James Bonard Fowler later admitted to pulling the trigger, saying he thought Jackson was going for his gun. The wounded Jackson fled the café, suffering additional blows by the police, and collapsed in front of the bus station. In the presence of FBI officials, Jackson told a lawyer, Oscar Adams of Birmingham, that he was "clubbed down" by state troopers after he was shot and had run away from the café. 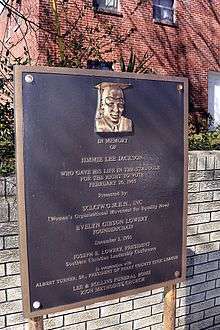 Jackson died of his wounds at Good Samaritan Hospital in Selma, on February 26, 1965. Sister Michael Anne, an administrator at Good Samaritan, later said there were powder burns on Jackson's abdomen, indicating that he was shot at very close range. Jackson was buried in Heard Cemetery, an old slave burial ground, next to his father, with a headstone paid for by the Perry County Civic League. 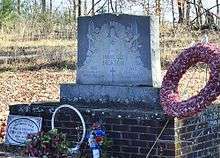 His headstone has been vandalized, bearing the marks of at least one shotgun blast. Jackson's death led James Bevel, SCLC Director of Direct Action and the director of SCLC's Selma Voting Rights Movement, to initiate and organize the first Selma to Montgomery march to present a way for the citizens of Marion and Selma to direct the anger over Jackson's death into a positive outcome. It also was called to publicize the effort to gain voter's registration reform. Held a few days later, on March 7, 1965, the march became known as "Bloody Sunday" for the violent response of state troopers and the sheriff's posse, who attacked and beat the protesters after they walked over the Edmund Pettus Bridge and left the city. The events captured international attention, raising widespread support for the voting rights campaign. In the third march to Montgomery, which began on March 21, protesters traveled the entire way, and a total of 25,000 people peacefully entered the city protected by federal troops and Alabama National Guard under federal command. In March 1965, President Lyndon B. Johnson announced his federal bill to authorize oversight of local practices and enforcement by the federal government; it was passed by Congress as the Voting Rights Act of 1965. After the act was passed, Jimmie Lee Jackson's grandfather Cager Lee, who had marched with him in February 1965 in Marion, voted for the first time at the age of 84. A grand jury declined to indict Fowler in September 1965, identifying him only by his surname. On May 10, 2007, 42 years after the crime, Fowler was charged with first degree and second-degree murder for Jackson's death, and surrendered to authorities. On November 15, 2010, Fowler pleaded guilty to manslaughter and apologized publicly for killing Jackson. He said he had acted in self-defense. He was sentenced to six months in jail, but served five months due to health problems which required surgery. Arguing that the sentence was too weak, Perry County commissioner Albert Turner, Jr. called the agreement "a slap in the face of the people of this county". In the 2014 film Selma, Jackson was portrayed by Keith Stanfield. The film graphically depicts the events of February 18, 1965, including Jackson's murder. ↑ "Jimmie Lee Jackson". biography.com. ↑ "Jackson, Jimmie Lee (1938-1965)". 1 2 uncredited (7 July 2011). "Former Alabama state trooper James Fowler freed in civil rights killing". Associated Press. Retrieved 19 September 2014. ↑ Brown, Robbie (November 15, 2010). "45 Years Later, an Apology and 6 Months". The New York Times. 45 Years Later, State Trooper Pleads Guilty to Killing - video report by Democracy Now!